What is creamy and rich, and easily one of the foods I'd pick to bring with me were I to be stranded on a deserted island? Why, that would be avocados, of course! Aside from the fact that add that irresistible layer of richness to so many dishes, Hass Avocados contribute good fats to your diet! Over 75% of the fat in avocados is unsaturated (monounsaturated and polyunsaturated), which makes them a fantastic substitute for foods that are high in saturated fat. Just one-fifth of a medium avocado (1 oz.) 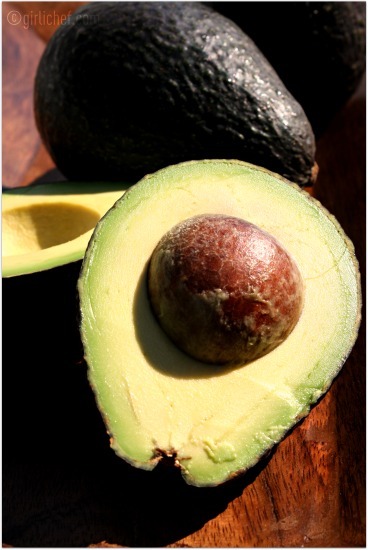 has 50 calories and contributes nearly 20 vitamins and minerals; this makes avocados a nutrient-dense foo choice. I love adding a smooth layer of avocado to almost any type of sandwich or torta...from BLT's to smoked turkey and swiss to warm, shredded pork to deeply spiced beef. Of course, my favorite use has to be as one of the major components of Tortilla Soup. I mean, in my opinion, tortilla soup isn't complete without it. I also love scooping all but a thin layer of flesh from a hass avocado, then dicing and folding it together with anything from chicken to salmon to tuna and piling it high back inside the hollowed out shell. And let's not forget the classic smooshed up version of avocado, better known as Guacamole. There are so many other avocado recipes that lend themselves to finger foods, as well. Check out these tailgating tips and recipes and recipes to get some great ideas for this football season! And how awesome would it be to put these tips and recipes into motion whilst tailgating in Pasadena before the Rose Bowl Game®? As a Midwestern girl with a deep love for the Big Ten (Michigan State, in particular), it's always been a dream of mine to head out to California and watch my boys play there in person! While I don't have much control over whether or not the boys in green make it there this year, I can still try to get there in hopes that they'll join me! How, you ask? Well... check this out. 1. Enter the weekly sweepstakes where a box of avocados will be given away every week for 14 consecutive weeks (runs September 5 - December 9). 2. A recipe contest where the winner will win a trip to the Rose Bowl Game® (runs September 5 - November 4). ✽This Grand Prize Package (for 4 people) includes round trip airfare, hotel accommodations, participation in a Rose Bowl Game® Welcome Reception, admission to the “behind-the-scene” Rose Bowl Parade® decorating site, sightseeing tour of Pasadena, admission to the Rose Bowl Game® on January 2. 2012 + more! More information on how the winner is chosen can be found in the official rules on their Facebook page. So, in anticipation of tailgating in the warm sun come bowl time, I wanted to try out something I've been meaning to make for quite some time now- Avocado Paletas! They are cool, creamy, and reminiscent of melons- not to mention packed with nutrients. That's my kind of dessert on a football day! Stir the warm water and superfine sugar together and add the jar of a blender. Peel and pit the avocado and scoop the flesh into the blender jar along with the sea salt and lime juice. Blend to a smooth purée. Fill popsicle molds (add sticks now or later, depending on the type of mold you have), and freeze until firm, ~4-5 hours. *I should tell you that, if you are not using superfine sugar, you will need to heat your water to dissolve the granulated sugar and then let it cool down to at least room temperature before proceeding with your paletas! But don't stop at popsicles...find more great avocado recipes at Hass avocados or click through for one of my favorite summer snackin' foods, guacamole. Or perhaps an Avocado, Salmon and Cucumber Salad? 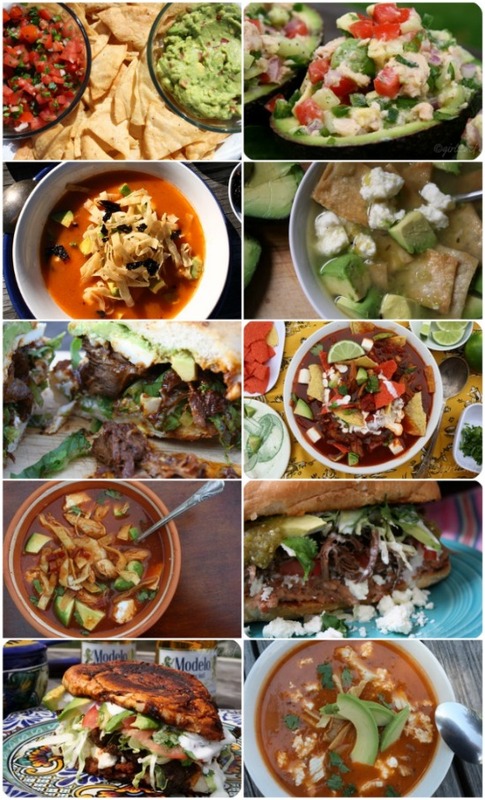 Or maybe one of my favorite meals of all time, Tortilla Soup (heavy on the avocado). Don't forget to layer the Hass avocado slices onto your favorite sandwiches, such as a Crispy Pambazo, a Roast Pork Sandwich, or any variety of a Torta. Later on today I will be making Fried Avocado with a Creamy Cilantro Lime dip...watch for that recipe to come soon. 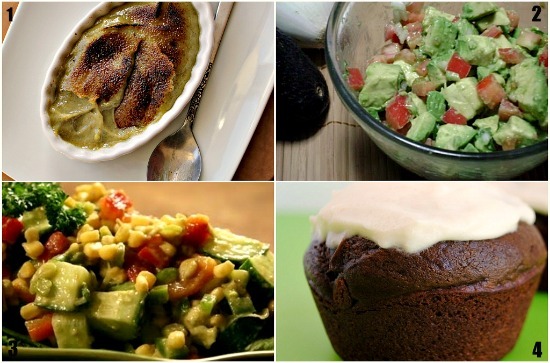 Or head on over to visit some of my friends wonderful recipes using avocado, such as Vegan Avocado Creme Brulee from Joanne. Or perhaps you need a different type of dip for you chip? Why not try Leslie's Chunky Avocado Salsa? Maybe you need a flavorful summer salad like this Avocado Corn Salad from Natashya? What's that? You say you want chocolate? Well, satisfy that urge with Bonnie's Chocolate Avocado Cupcakes. For more great recipe ideas and nutrition information, sign up to receive free emails from Hass Avocados...they'll load you up with great ideas once per month! You go BBFF!!!! I always hope that someone who is enthusiastic and talented will win! I am not here to win, but to thank you for inspiring me with your avodacos recipe; I LOVE it, but only use it for my guacamole. NOw you have really giving me great ideas. Thanks. Oh, you are talking to me! I love them!!! That is one beautiful popsicle! I think you have a winner with that one. It definitely has my vote! I am definitely on Team Avocado. They make everything twice as delicious. Plus, they're nature's laxative! Oh, sorry. I was probably over-sharing with that little tidbit. Que originalidad, es una delicia. TKW- thanks for the info, I didn't know that. Also I see some recipes blending sugar and avocado... love avocado but have never tried it sweet. Is it something I need to try or is it a waist of avocado... Thoughts? @Walking Tours Rome... I think it depends on what the recipe is. 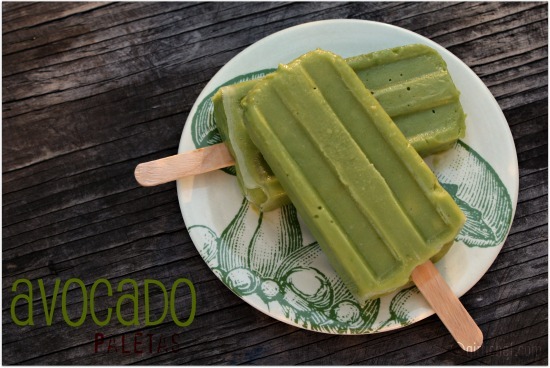 The recipe for Avocado Popsicles in this post use sugar. My personal opinion is that sugar makes avocado taste a bit like melon. Aww thanks so much for featuring my creme brulee! Those paletas look AMAZING. Summer may be over but I need them in my life! Can't wait for more wonderful avo recipes!! @Pily... Sí, son muy buenos ... tienen un sabor casi como un melón! thanks for the feature, what a fun contest!!! really who doesn't adore avocados!! What isn't better with an avocado! I will definitely participate in the contest if I can get my bootie in gear in time. I love the paletas de aguacate! Avocados would be on my survival list too. ;-) Your paletas look creamy and amazing. Can't wait to see your fried avocado recipe too. Perfect recipes for a Southern Californian diet!